Kent has become well known for its art scene, which continues to flourish in the downtown district through galleries, shops featuring local artists, live music events, and public art. At Main Street Kent, the planning has begun for the 2019 edition of First Friday Art Walks. 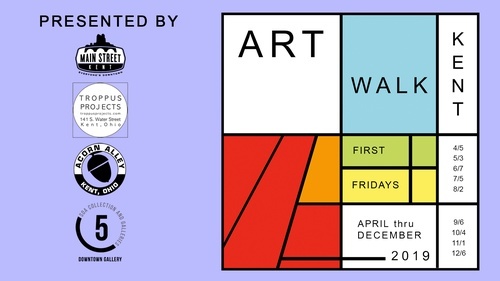 The 2019 First Friday Art Walks will begin on April 5, from 4pm – 7pm, continuing through December 6, 2019. All participating galleries, studios, and creative businesses will extend their business hours to at least 7pm on the first Friday of each month, welcoming anyone interested in exploring the artwork inside. These events are free, and are sponsored by Acorn Alley, Kent State School of Art Galleries, Main Street Kent and Troppus Projects. New this year, guests may pick up a free Art Walk postcard at any participating location, and while out exploring, have their postcards punched at any four Art Walk stops. Then, enter our drawing for an artsy prize; prize will be provided by a different business each month! Visit the Main Street Kent website http://www.mainstreetkent.org/events/art-walk/ for more information. Feel free to call Main Street Kent 330-677-8000 with any questions.